It would be far from near before I treat myself to such a delicacy, aside from being expensive, a friend has influenced me on how she doesn’t approve the way foie gras are obtained…that of forcefully fattening the ducks. So here,I settled for second best…ordinary duck liver cooked the chinese way. This dish takes half an hour or less to finish. 1. Soak the dried wood ears in warm water for about 15 minutes, then cut into pieces before use. 2. Bring a large pot of water on to a boil, cook the pork liver over medium high heat until half way cooked, about 1 minute. Drain well. 3. Place a wok over high heat, add 2 tbsps. vegetable oil and drizzle to coat both the sides and the bottom of the wok, saute scallion, ginger until aromatic, about 20 seconds, do not brown, then add back pork liver and wood ears, stirring and tossing, sprinkle 1 tbsp. rice wine over them while cooking, pour into 1/2 cup water and keep on a steady simmer over medium heat. 4. Stir into 1 tbsp. chicken essence and 1 tbsp. ground black pepper when the pork liver are almost cooked, taste and adjust seasoning as desired. 5. Give the cornstarch and water mixture a quick stir, then swirl into the wok in which it was cooked, stir to thicken. 6. Remove from the wok to a plate, serve hot. You probably remember I cook liver once a week…all because my older son has iron-deficiency and liver is one of the best source of it. 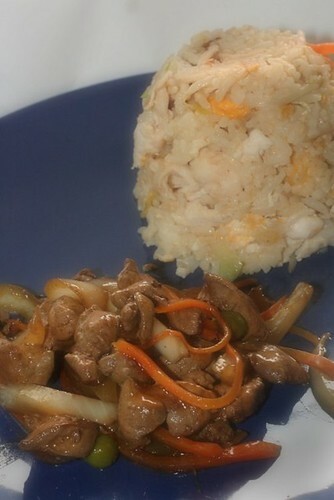 Aside from liver steak and adobo, this dish is a very good alternative. looks so yummy especially the rice.. Happy FTF! I only cooked chicken liver,I’m not sure if duck liver is available here,never seen one yet.Maybe at the Asian Store. Looks yummy! I’ve never seen just duck livers at the stores. They usually come inside the frozen birds.